In the 2004 film, Sideways, the movie’s best known dialogue takes place outside a Los Olivos, California restaurant in the Santa Ynez wine region. The main characters, Miles and Jack, are meeting their dates for the evening. Miles famously states, “If anyone orders Merlot I’m leaving. I am not drinking any (expletive) Merlot.” With those words every moviegoer became an instant wine expert eschewing Merlot in favour of Pinot Noir. With those words a market backlash against Merlot was launched and sales of Pinot Noir went crazy. This massive switch to Pinot Noir by the movie going public became known as the ‘Sideways Effect’. Merlot became popular in the 1980′s. It was a medium bodied, easy drinking red that enjoyed mass appeal. A wine everyone could enjoy with its soft, fruity flavour – the Barry Manilow of wine. By 2004, the love affair was over as the market had been flooded with over-priced, volume produced, poor quality Merlot. Enter Sideways and the quest for Pinot Noir. California wineries interested in following consumer trends, albeit fickle, pulled out their Merlot plantings and replaced them with the much sought after Pinot Noir. There were those insiders in the industry who were of the opinion this was a favourable development; they saw it as a step in the right direction towards Merlot’s redemption. Due to consumer demand, without regard for soil types and weather conditions, Merlot had been planted in so many areas of California that much of it was simply in the wrong location to grow grapes capable of producing a great wine. Grapes properly matched to the vineyard site produce excellent results. Equally, mismatched grapes produce poor quality wines. It is often remarked that wine is made in the vineyard meaning no amount of alchemy in the winery is going to produce a great wine. The Sideways Effect resulted in a shakedown in the industry with the removal of Merlot grape vines planted on inappropriate sites. Merlot grapes lead in some of the world’s most famous and most expensive French wines: Chateau Petrus, Chateau Cheval Blanc and Chateau Palmer. It is said of Merlot grapes that they are capable of producing serious wines but planted on the wrong site, over-cropped, and managed for quantity not quality, the result is plonk. Alas, I would think this to be true of any wine varieties not just Merlot. According to the most recent BC Wine Grape Acreage Report (August 2011) the most planted grape in British Columbia is Merlot. In fact, Merlot is the principal variety grown in the following regions: Similkameen, Osoyoos, Oliver, Kaleden, and Penticton/Naramata. 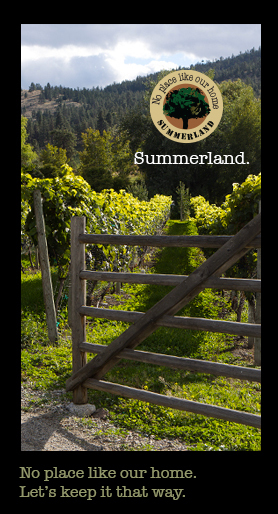 The principal varieties in Summerland/Peachland region, according to acreage, are Gewurztraminer, Pinot Gris, and Pinot Noir. 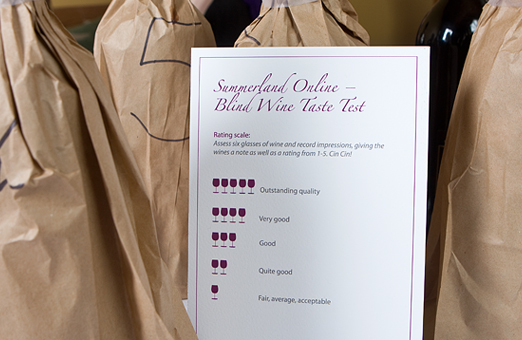 In deepest, darkest February, a coterie of wine drinkers and winemakers held a blind tasting of six different Merlots. To be clear, this merry band (made all the more merry by the sampling of Merlot) are not professional wine reviewers but rather individuals with their own wine preferences and opinions. The group, which included Kathy Malone, winemaker at Hillside Winery, Ron Watkins, former owner of Dirty Laundry Winery and yours truly; Kim Stansfield, and John Gordon, owners of Valentine Farm and The Vinegar Works, used a simple 1 – 5 rating, number 1 being, well, number 1 or the overall favourite. 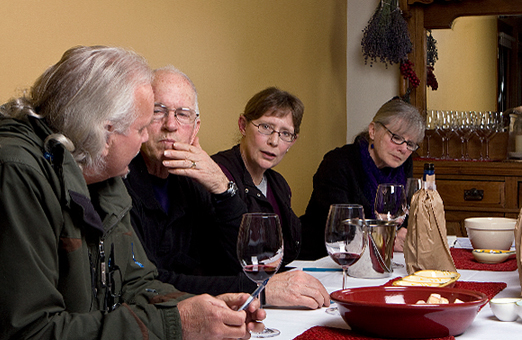 The group judged five Canadian and one $9.00 Argentinian wine, with surprising results. 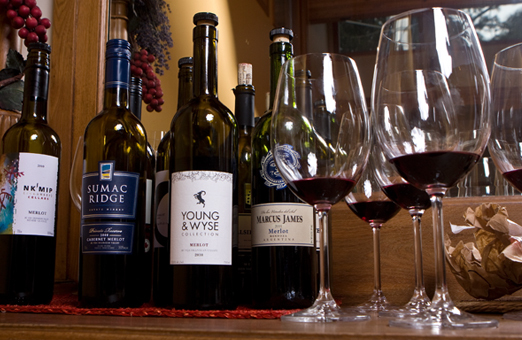 The most expensive wine won and the wine that was the least expensive did not come in last: The Argentine wine came in 4th place, and the overall winner by consensus was the Merlot from Young and Wyse Winery in Osoyoos. It was interesting to note some of the nuances that were picked up, such as a comment from Ron Watkins; he thought the 8th Generation wine might be German. Good palate there Ron. He also noted that the garlic in the dinner provided by the host, Stephanie Seaton, tasted burnt. Special thanks to Kathy Malone of Hillside Winery, and Ron Watkins former owner of Dirty Laundry Winery – for being on our Sidebar Wine Tasting panel. 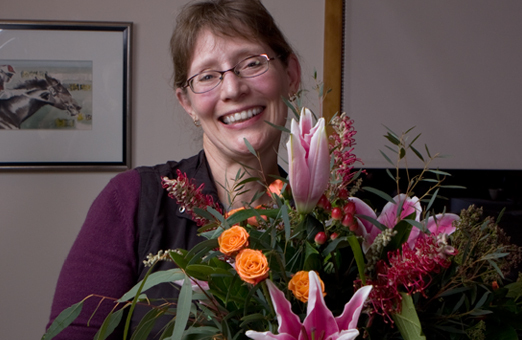 Also thank you to Henry King, owner of Art Knapp’s Plantland and Flower Shop for his generous sponsorship of the wine tasting – with the gorgeous flowers – won by a very pleased Kathy Malone from Hillside Winery.